MoonMarble.com - Ernie Kober - "Ocean Marble on a Penguin Stand"
Art Glass → Contemporary Handmade Marbles → Ernie Kober - "Ocean Marble on a Penguin Stand"
Handmade contemporary marble by Ernie Kober. 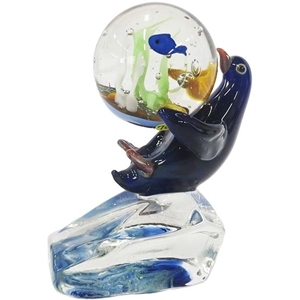 This marble has a underwater scene trapped inside the clear glass featuring a blue fish and some seaweed. The marble is held in the flippers of a cute penguin resting on a clear ice block. Marble diameter is approximately 1 1/4" and stand is approximately 2 1/2" x 2 1/2".